There's no denying that Necromunda has some stunning models, especially their named characters and bounty hunters. The Belladona model has such a strong profile and concept to it, and this paint job emphasizes all of that with some great color choices and fantastic technique. I really like how all the mechanical parts of her are bright and in your face, like a hotrod car, while everything that's organic is more subdues and neutral. The blending on all of it is superb as well. It looks like he used a stippling highlight technique, which really gives the flat areas some good texture. The face and hair are both pale, but not in a sickly way, which helps draw your eyes right to it amongst all the darker and more saturated colors. The colored feathers help frame that even more and tie the organic side of her into the mechanical a little bit. The small amounts of freehand reinforce that hotrod feeling without overpowering the model, while also showing off the painter's skill. The mostly blueish model is framed nicely by the warm, orange base. 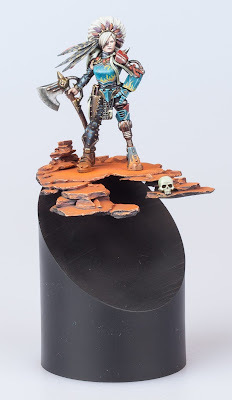 While the basing is simple, it's also really cool with the rocky surface overhanging the void of the plinth. The weathering on her feet help tie it all together as well. 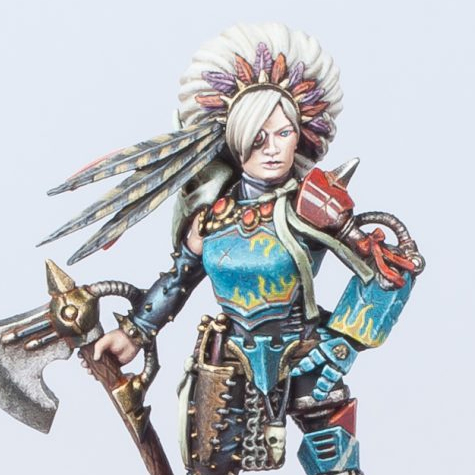 Really, this model is just outstanding and I'll be impressed if I see a better version of Belladona than this anytime soon.